Verizon confirmed plans to launch its 5G Ultra Wideband Network in Chicago and Minneapolis on April 11, and in more than 30 markets across the country by the end of the year. The company previously launched a 5G fixed service for home broadband in October 2018 in certain neighborhoods of Houston, Los Angeles, Sacramento and Indianapolis. Verizon is offering the new 5G moto mod, which pairs with the moto z3, to form a 5G-enabled smartphone. Verizon will offer unlimited 5G data for $10 per month (with the first three months free) above the cost of a current 4G plan. Verizon provided a broad update on its 5G vision, saying it will pursue a multi use case strategy encompassing deep fiber access, spectrum, software-defined networking and multi-access edge computing (MEC) platforms as key technologies for enhancing the user experience. Verizon confirmed plans to launch its 5G Ultra Wideband Network in more than 30 U.S. cities in 2019. Verizon 5G Mobility will launch in the first half of 2019, and Verizon 5G Home will expand coverage to more markets in the second half of 2019. 5G Mobility and 5G Home are expected to contribute more meaningfully to growth in 2021. Verizon's Mobile Edge Computing platform, which will enable real-time enterprise applications, is expected to launch in fourth-quarter 2019. Verizon’s 4G LTE network currently covers 2.6 million square miles. The network coverage includes LTE Advanced features in 1,500 markets across the country, which provide significantly more capacity and faster peak data speeds. Verizon Intelligent Edge Network (iEN), which will be the multipurpose network that serves as the foundation for the company’s network-as-a-service strategy, is rolling out in more than 60 cities across the U.S., with more than 25,000 Verizon-owned fiber miles expected to be deployed by year-end. 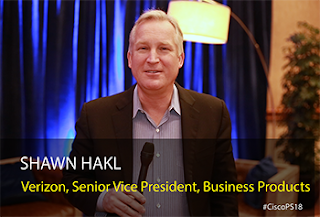 One Fiber opens new revenue opportunities while also bringing cost efficiencies. Verizon will be deploying Next Gen PON 2 nationwide wherever it deploys fiber assets. Verizon is on track to deliver against its goal to achieve $10 billion in cumulative cash savings by 2021. Verizon has acquired ProtectWise, a Colorado-based company which provides cloud-delivered Network Detection and Response. Financial terms were not disclosed. Verizon Communications reported a strong finish in fourth-quarter 2018, noting 1.2 million retail postpaid net additions in fourth-quarter 2018, of which approximately 650,000 were phone net additions. Retail postpaid phone churn was 0.82 percent in the fourth quarter, indicating continued strong customer loyalty. The full earnings report is expected on January 29th. Verizon issues $1 million "Built on 5G Challenge"
Verizon is offering up to $1 million in total grant funding as part of a “Built on 5G Challenge”. The funding will be provided to winning innovators to develop their concepts on live 5G networks located at Verizon’s 5G New York Lab, 5G Waltham Lab, 5G Cambridge Lab, and new locations being developed in Los Angeles, Palo Alto, and Washington, D.C. 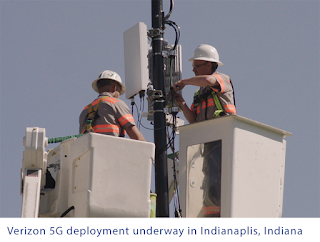 In addition, Verizon 5G Labs technical advisors will provide training and support to winning innovators. Verizon is introducing a Home Network Protection (HNP) service powered by McAfee to provide protection throughout a home network.The servuce protects against malicious websites, provides parental controls and helps keep devices connected to the home network, including Internet of Things (IoT) devices, protected. Verizon will replace the Oath brand, which brought together Yahoo, AOL and other properties, with a new brand to be called "Verizon Media Group. The announcement follows a Verizon disclosure earlier this month of a $4.5 billion accounting charge to write down the value of Oath properties. Verizon said its media group remains a core pillar of its business. Verizon announced that approximately 10,400 employees have accepted its voluntary separation offer to leave the company next year. The program offers up to 60 weeks’ salary, bonus and benefits, depending on length of service. Verizon had 152,300 employees at the end of third-quarter 2018. 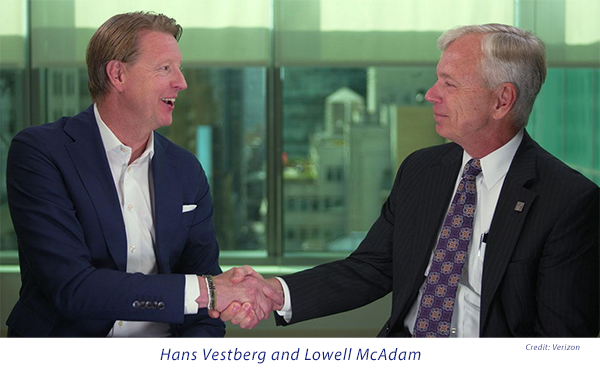 “These changes are well-planned and anticipated, and they will be seamless to our customers,” said Verizon CEO Hans Vestberg. “This is a moment in time, given our financial and operational strength, to begin to better serve customers with more agility, speed and flexibility. 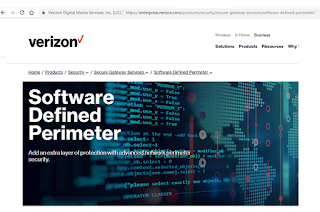 Verizon has acquired the PrecisionAccess solution and other Software Defined Perimeter (SDP) related assets from privately held Vidder. 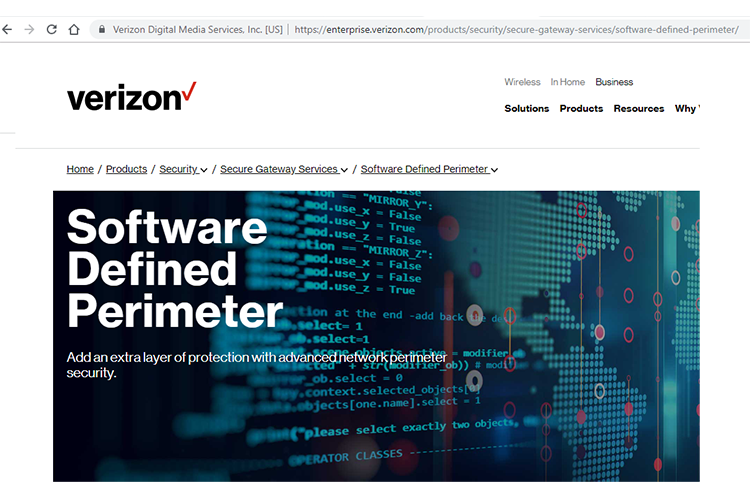 Vidder’s advanced technology is already integrated into Verizon’s SDP service, which helps organizations protect application infrastructure against cyber threats by blocking connectivity from unknown devices and making them invisible to anyone without approved access. Verizon’s SDP provides pre-authenticated, context-aware, secure access to enterprise applications, helping to reduce the security risks associated with the multiple endpoints of an increasingly digital, mobile and virtual business world. 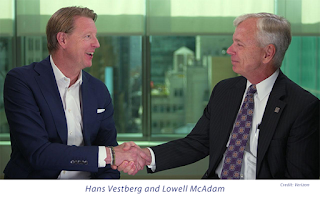 Verizon Business Group will include the wireless and wireline enterprise, small and medium business, and government businesses, as well as wireline wholesale and Verizon Connect, the company’s telematics business. It will be led by Tami Erwin, currently executive vice president - Wireless Operations. There will also be a network and IT organization supporting all three groups, along with corporate-wide staff functions. Verizon will launch its fixed 5G service on October 01 -- claiming the title of first 5G commercial service in the world. The Verizon 5G Home service uses the company's proprietary 5G TF standard. Verizon said it chose to implement its own 5G TF specification in order to launch its 5G network sooner than waiting for the formal 3GPP 5G NR standard to be incorporated into network equipment, devices, chipsets and software. The company plans to upgrade any installed equipment once the full 3GPP standard is adopted by equipment suppliers. Verizon 5G Home will initially be available in parts of Houston, Indianapolis, Los Angeles and Sacramento. Customers in these cities can begin ordering the service on Thursday, September 13th. Verizon said customers should expect typical network speeds around 300 Mbps and, depending on location, peak speeds of nearly 1 Gig, with no data caps. Verizon will offer a “First On 5G” promotion whereby customers get 3 months free. Current Verizon Wireless customers with a qualifying smartphone plan will pay $50 per month for the service, while non-Verizon Wireless customers will pay $70 per month (taxes included and no annual contract). There are no additional hardware costs. 5G Home customers will also get YouTube TV free the first three months ($40/month thereafter) and a free Apple TV 4K or Google Chromecast Ultra device at installation. 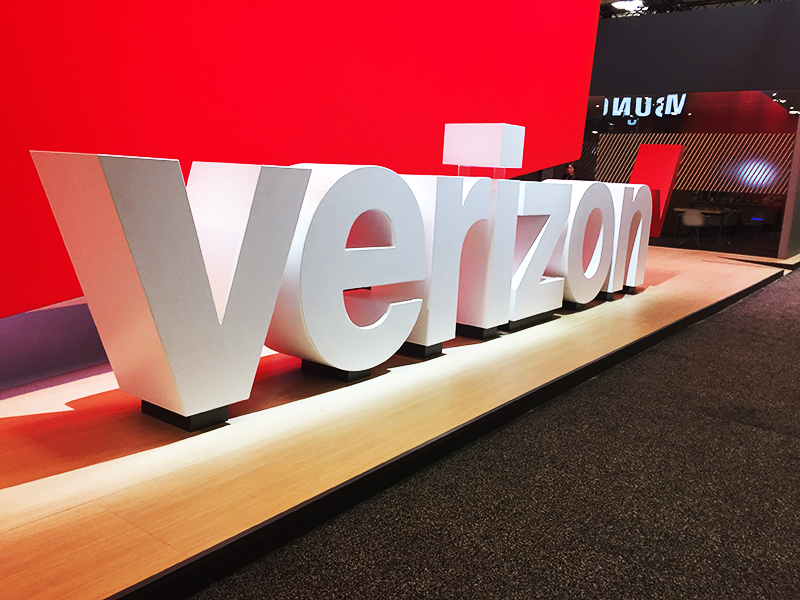 Verizon is expanding its 5G incubator program with new locations on the East and West Coasts. Building on its first 5G innovation center in NYC, Verizon now plans to open 5G Labs in Washington DC, Palo Alto CA, Waltham MA, and Los Angeles CA. The goal of the labs is "to explore the boundaries of 5G technology, co-create new use applications and hardware, and engage with the community through programming designed to encourage local innovators to rethink what’s possible in a 5G world."